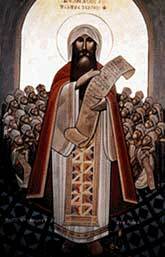 O Lord, who didst establish thy servant Athanasius, through wisdom, in thy truth: Grant that we, perceiving the humanity and divinity of thy Son Jesus Christ, may follow in his footsteps and ascend the way to eternal life; who liveth and reigneth with thee and the Holy Ghost, one God, now and for ever. Amen. We were made "in the likeness of God." But in course of time that image has become obscured, like a face on a very old portrait, dimmed with dust and dirt. If you see with your own eyes men and women and children, even, thus welcoming death for the sake of Christ's religion, how can you be so utterly silly and incredulous and maimed in your mind as not to realize that Christ, to Whom these all bear witness, Himself gives the victory to each, making death completely powerless for those who hold His faith and bear the sign of the cross? No one in his senses doubts that a snake is dead when he sees it trampled underfoot, especially when he knows how savage it used to be; nor, if he sees boys making fun of a lion, does he doubt that the brute is either dead or completely bereft of strength. These things can be seen with our own eyes, and it is the same with the conquest of death. Doubt no longer, then, when you see death mocked and scorned by those who believe in Christ, that by Christ death was destroyed, and the corruption that goes with it resolved and brought to end. Note: Further information on Athanasius may also be found at the Christian Classics Ethereal Library.